1 of 3 Pit peaches and plums and finely chop. Place in a medium-size bowl. Add red onion, jalapenos, cilantro, lime juice, olive oil and 1/8 teaspoon of the salt. Stir to combine. Cover and refrigerate for at least 1 hour. 2 of 3 Heat grill or broiler. Season pork chops with remaining 1/8 teaspoon salt and the pepper. Grill or broil for 5 minutes. Turn and grill for an additional 4 to 5 minutes or until internal temperature registers 155 degrees on an instant-read thermometer. 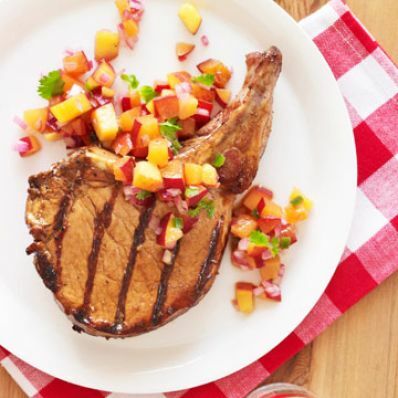 3 of 3 Serve the grilled pork chops with the salsa. Accompany with cooked rice, if desired. Per Serving: 130 mg chol., 4 g sat. fat, 3 g fiber, 384 mg sodium, 21 g carb., 13 g Fat, total, 386 kcal cal., 46 g pro.